Birdist: So, some folks want to de-extinct the Passenger Pigeon. The plan is to pull as much DNA out of museum specimens as possible,fill the gaps with Band-tailed Pigeon DNA, and breed the new birds using Band-tailed stem cells. Easy peasey. The birdosphere appears split between loving this idea and hating it. I love it. An extinct species back from the dead! Passenger Pigeons once again darkening the skies along the eastern seaboard! I think it would be a triumph for science, and an important step for humanity's relationship with nature. I will elaborate on why later on, but I want to hear your thoughts first. On Facebook, you commented that this whole pigeon business was "Short-sighted gimmickry." Why? Rick Wright: Hare-brained schemes like this always raise the same question. Cui bono? Say that we can pull it off and somehow generate an honest-to-goodness genetically "pure" passenger pigeon. Who benefits? It may be a clever parlor trick, but it does no good to humans, who surely won't be permitted to hunt and eat them, or to the ecological well-being of the eastern deciduous forest, which has got along without a big, gregarious pigeon for nearly a century and a half. And it certainly is of no help to the de-extinctificated birds themselves, which would enter a world utterly unrecognizable to their ancestors, lacking the social framework provided by the millions of conspecifics and the food supply once offered by the -- functionally extinct -- American chestnut. It's a sad thought, a single or a dozen or a hundred huddled pigeons, conjured out of bits of organic crust scraped from ancient skins and dropped into a habitat that has kept on evolving without them. Birdist: I disagree that doing this will not be good for humans. In fact, I think it will be an incredible thing for humans, not merely as a scientific accomplishment (though it would certainly be that), but as a moment where humankind acknowledges that we should not give up on fixing our world. Whether we like to admit it or not, it's a human's world out there. There is no corner of the planet that humans have not changed, either directly by paving it over and living on it, or indirectly by polluting it, changing its climate, hunting its animals or simply visiting it. Yet, despite the suffocating 10-count body slam we have collectively laid atop Mother Nature, the majority of humankind doesn't believe it. Climate deniers believe the world is too big for humans to possibly alter its atmosphere. Polluters and developers around the world don't understand or consider the collective impacts of their activities. But I don't think humankind is so malevolent. The majority of the environmental problems we've caused for ourselves have come out of ignorance (of the consequences, of the cumulative effects), not evil. We don't want to destroy the world, but we haven't been able until recently to conceptualize and visualize the harm of our own growth. The flip side to the disbelief that we have caused all our own problems is the sense of fatalism making us think we can't fix any of our own problems. People forget that in several respects - water quality most notably, thanks to the CWA - this country is in better shape than it was 50 years ago. This fatalism I believe stems from the same mistaken belief - mixed with a healthy dose of shame - that worldwide problems are too big to fix. Resurrecting an extinct species, then, will help people realize that no problem is too big to tackle. If a hundred years of extinction isn't the end of a species, does cleaning the air seem so daunting? Does helping the American Chestnut? Humans need a reminder that we're the only ones who can get ourselves out of this mess, and we can if we try. Rick Wright: No argument here with any of the observations you make: this is a human planet, and a great deal of what we mean by that is not positive. And it's most certainly going to take considerable human effort to redress some of the wrongs we've done ourselves and make the world a bit more habitable for us and for the wild things we share it with. I'm assuming that your charge of fainéant fatalism isn't leveled at me. I firmly believe that we can and that we must work actively and positively against ignorance and greed, and I agree with you that sometimes it takes something flashy to wake people up. But I disagree with the notion that "resurrecting an extinct species" is likely to inspire either introspection or action. At best, letting a few pigeons loose will result in a day's headlines; at worst, and paradoxically, it will mislead the heedless and the lazy into believing that any environmental problem can be solved by waving a magic petri dish and hallelujah, all's right with the world once again. Curiosity, which is always ineffective, will be succeeded by complacency, which is always dangerous. So far I've been suggesting that nothing positive would come out of this scheme. Let's look at the very real risks, too. We really don't know much about how those billions of passenger pigeons interacted with other species in the American wilderness, but the impressive descriptions of nineteenth-century travelers and naturalists should give us pause: vast tracts of forest laid waste, the stench unbearable, all the food stripped for miles. Not that there's anything wrong with that, unless like most of the human population of the US and Canada you happen to live where that devastation would play out. Are we prepared for the changes in the environment that the sudden presence of this species would bring? Or will we be content just to produce a few dozen birds for zoos and circuses -- and what would be the point of that? Birdist: Certainly it would be quite an ecological shock if we let billions of new birds loose at once, but that isn't the plan, is it? I was assuming that these pigeons would start out with a small recovered population and then grow to fit whatever natural space they can fill with whatever habitat there is left. 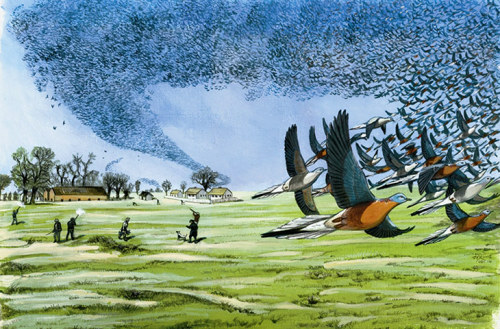 We would likely never again see the day-long clouds of birds that once existed, the kinds of swarms that were responsible for so much devestation. On the other hand, this type of swarming was obviously a tactic of the species - the same as any other bird or animal that moves in great numbers - and new birds could naturally return to this type of behavior. Do you object to the resurrection of the Passenger Pigeon because of its individual characteristics, or do you object to bringing back any species? What about a less overwhelming bird, like a Carolina Parakeet? I certainly agree that I want to avoid widespread ecological harm, but I don't see that as likely. Maybe I'm wrong about that, but the forest has hosted them before and I think we can handle it again. Rick Wright: It's been suggested more than once that the passenger pigeon passed from the scene precisely because it could survive only in those overwhelming swarms, that for whatever social or biological reason, the species' threshold of extinction was quite high. If that was true of the wild population in the late nineteenth century, it would almost certainly be true of any reconstituted birds, and we'd find ourselves stirring up another batch every time the token outdoor population dipped below a certain level, a prospect I find grotesque and saddening. I just can't see a function for such a bird beyond its novelty value, and I don't think novelty can justify a project of such unforeseeable consequence. As to the parakeet, it was shot into extinction as an agricultural pest. Pragmatically, I don't think raising that species from the dead would be any wiser than releasing, say, a cageful of queleas. But we don't have to speculate. In a sense, we've already conducted the pigeon experiment several times here in North America. The wild turkey was essentially extinct over most of its eastern range in the early twentieth century; captive breeding and artificial stocking have been tremendously successful, and the bird now occupies all of its former range -- and many areas where it never occurred historically. Result? Lots of wild turkeys to admire, and lots of wild turkeys to terrorize suburban neighborhoods, destroy the eggs and young of ground-nesting birds, and spread pathogens to native plants and animals. Just 80 years ago, the trumpeter swan was barely a memory in places where it had once been abundant. A slow and steady increase in its historical populations on the Great Plains has coincided with an explosion of introductions and re-introductions in the east. Result? In many places, tough times for smaller waterfowl and for human families with little children. White-tailed deer? You get the point. Now I'm not fond of arguing by example and analogy, but we can safely assume that it is impossible to predict the effects on us and our environment any time we manipulate the populations of a wild animal -- and that it's even impossibler in the case of an extinct species brought back to "life." And beyond these practical concerns, I think there is a serious philosophical objection. Birdist: I'm eager to hear your philosophical objection, but my response to your practical objections is to reiterate my earlier point about it being a human's world. Because of the inescapability of our own impacts, we're basically managing all species to coexist with us. Releasing Passenger Pigeons wouldn't be the end of the story, but the beginning of long (unending?) process of management. Yet, I'd still rather live in a world with Passenger Pigeons - and Carolina Parakeets and Wild Turkeys and White-tailed Deer and Trumpeter Swans and Mosquitos and Ticks - than live in one without any of them. Managing these species I agree can be grotesque and sad, but so is extinction, and I'd rather face the consequences of human growth than have a species be lost forever. I agree that it's impossible to predict the effects of manipulating populations of wild animals, but we're doing it all the time - some more directly than others - and so the fear of unforeseen consequences isn't enough not to act. I think that bringing back extinct species is an extremely selfish thing for humans to do - attempting to assuage our collective guilt at destroying the thing in the first place only to likely cause another round of misery for the new batch - but I don't think that's a reason not to do it. On the contrary, selfishness is, as far as I can tell, the only thing all species have in common. I think exercising our ability to correct our past mistakes will make us a better species, more willing to engage with our impacts and work towards finding an equilibrium. Rick Wright: So let's engage with the impacts we're having today, on species that are alive and at risk today, in habitats that are being compromised and destroyed today. Conservation is a zero-sum game, with effort devoted to one problem no longer available to another. It makes much more sense to me to see money and expertise brought to bear on the issues facing the real world of 2013 than to spend resources in an attempt to restore one -- admittedly flashy and appealing -- isolated element from a world that passed away a hundred years ago. Which brings me to a final objection, one that to my mind applies to all such attempts to "revive" an extinct organism. How do we determine the point at which the world was "best" or closest to a mythical "equilibrium"? What makes an environment with one given species in it better than an environment with another? Why is the status quo of 1913 or 1813 or 20,013 BC somehow the ideal to which we should aspire? The notion that there has ever been such a thing as the authentic, the pristine, the Arcadian is indefensible; the world changes, continuously,and only sentiment and nostalgia permit us to dream of choosing where we step into the Heraclitean river -- and then stopping its flow. It's a shame that a bird as fine as the pigeon is gone, and a bigger shame that we played such a big role in its loss, but we need to live in the present, and do everything we can to make the present more livable. Birdist: We certainly agree on the point that there is no "correct" environment. Life isn't a Calder mobile that's out of balance until some final touch, and then we can back away with life in equilibrium. Extinction isn't a moral failure on its own; thousands or millions of species lived and died out before humans even entered the scene. The difference with Passenger Pigeons is that WE did it, their blood is on our hands. The equilibrium I spoke of isn't between nature and itself but between humans and nature: if we can get to a point where we can live sustainably, then both humans and the rest of the natural world are better off. I believe that understanding that we can correct our own mistakes will empower us to work toward more solutions. Reviving the Passenger Pigeon won't get us there - I agree with you that ecologically, it may indeed be more trouble than it's worth - but it is a step towards a world where humans better acknowledge and respond to the messes we've made. Rick Wright: You know, it occurs to me that the discussion of the pigeon project -- including this enjoyable conversation with you -- may be just as important as its possible execution. The mere idea has got lots of people talking and thinking about loss and conservation, and I can't think of anything better for us and for our messes than that. Talking about the pigeon may be just as useful as bringing it back -- but that conviction won't keep me from being first in the ogling line if the mad scientists really do make it happen. My biggest problem with de-extinction is that any serious effort to resurrect and reintroduce an extinct species is going cost a lot — for the initial cloning, for subsequent captive breeding and reintroduction, and then for protecting the reintroduced population. Unless some wealthy philanthropist steps in, that funding is likely to come out of existing conservation programs. I'd rather see the funds and effort go toward species that have an existing population for scientists to work with than see it diverted to something that might not be more than a gimmick. In light of the Passenger Pigeon's need to live in large groups, any attempt at reintroduction (including "making" new ones to introduce) is doomed. But I do not see the introduction of Wild Turkeys as a failure. They are not a major factor in ground bird nest failure and not much of a threat to suburban families. I think the problem with Rick's argument is that if you hold to it, it's difficult to see how you justify trying to save any species. The world is changing, yes, and without conservation, many current species will go extinct. Rick's argument is that the pigeon wasn't adaptable to the changes it faced, so it should be left gone. But what makes the species on the verge of extinction now any more worth saving? It could be argued that many are even less adaptable than the pigeon (since they are going extinct despite conservation efforts--there were no efforts to conserve the pigeon). Why is trying to preserve the current moment in time any more noble than trying to go back to 1912? Why bother doing anything at all? One more thing. Behind a lot of the arguments against de-extinction is, I think, a desire to force man to wear the hair shirt of what we've done for all time. You caused the extinction of the Passenger Pigeon, you can't undo this unforgivable sin, let this be a lesson to you for all time. We can't allow man to fix this, because if the fix didn't itself cause environmental catastrophe, god knows what manipulations we'd go for next. We can only imagine what corporate America will do if if thinks it can always undo its mistakes. In my experience, though, this kind of approach to changing behavior rarely works. The forbidden fruit only becomes more and more of a panacea, and the original sin fades over time (how many kids growing up today even know what a Passenger Pigeon is?). Better to let a project like this go forward, and encounter all the difficulties Rick so eloquently predicts, in full public view, than leave folks In the generalized comfort of "oh well, we can always clone that one and bring it back down the road when we want it and are ready for it again." Everyone will know what a Passenger Pigeon is, maybe as with the IBW, it will lead to some conservation of big tracts of land for the birds to roam, or restoration of old habitats. Most importantly, people will better understand how much we've changed the world since 1912, less able to remain the proverbial frogs slowly boiling to death we've become. At the end of the day, it's not change that's unnatural or immoral (I agree with Rick there's nothing special about 1912), it's the *rate* of change that man imposes on nature, providing no opportunity for adaptation or co-evolution, that's problematic (something that e.g. climate deniers pointing to natural cycles fail to understand), and any effort to revive the Pigeon would throw this into high relief, I think. I'm saddened by the destruction of our environment, and the extinction of so many species of animal and plant. If we're able to revive species, then why shouldn't we? Some of the most successful parks in the US are managed. Central Park comes to mind. Man made waterfalls, pools where the toxicity level is monitored, planting of native species of plants. With the continual urbanization of our world, these managed parks will become more important. Why not also manage the species of animals that can thrive and be introduced into these environments? Great comments everyone, thanks! Just so it's out there, I want to talk about the "don't divert money from conservation projects" argument. Playing devil's advocate, one could argue that spending lots of money to prop up doomed species is a worse use of money than letting the species go extinct and then bring them back when conditions are better. That's a very blunt way to say it, and of course presupposes that we live in a world where de-extinction is possible, but I think it makes sense if we're worried about economics. Take the California Condor, for example. Lots of money and effort are spent on protecting the last few birds, but they keep eating lead shot and dying. What if instead we were to let the birds become extinct temporarily, let bans on lead shot cycle through until there is no lead shot left, then bring the condors back? Wouldn't that be the most efficient use of resources? Thanks, Rick, for calling my attention to the discussion. On the whole I stand with you: recreating the Passenger Pigeon would be a sort of parlor trick, without any real significance toward how we humans are affecting the planet. This is particularly true for the Passenger Pigeon, because it is particularly unlikely that it could ever exist in the numbers which so impressed the 19th century. If we were to bring any species back, it should be one for which the ecological conditions exist for re-establishing a viable wild population. We have in fact done this, though not all the way from the DNA. When the California Condor was reduced to less than 20 individuals, they were all trapped, and bred in captivity (despite some opposition) until there were enough to release into the wild, not only in their recent range in southern California but also in the Grand Canyon. Problems with lead shot, aimed and un-aimed, persist, but I believe that California has outlawed it, though it will take some tie for all existing lead shot to be used up. BirdLife International regularly describes efforts to maintain small island species such as the Tahiti Tyrant and the Mauritius Kestrel. The Millerbird has been transplanted to Laysan Island. In all these cases, an ecosystem which could support the species remained largely intact, if often threatened by human-introduced species such as the Norway rat. These are the efforts we should devote ourselves to. Thanks for your comment. However, I disagree with your assessment that sufficient habitat needs to exist to support 19th century numbers before the species is brought back. First, the goal of having the passenger pigeon back would not be to return it to its former numbers. Such a thing is impossible, as it is for most any species of any kind. Continuing your example of the American bison, that species exists in just a fraction of its 19th century numbers, yet we continue to foster it, with whatever habitat we can protect. Which brings me to my second point, that the habitat/species question is a bit of a chicken and egg problem. In the case of the bison, the existence and growth of the species is itself the driver for additional habitat creation and conservation. The major controversy at Yellowstone and wherever else bison live is how to conserve additional land for their growth. Protecting land in sufficient quantities for huge numbers of passenger pigeons would be impossible without any in existence, but if they were a live and growing population it would be easier to make the case for additional habitats.